If I could define my hair in a place, it wouldn’t be a salon chair; it would be the kitchen—a place that is usually wrapped up in images of culinary comfort and family gathering over nourishing plates of food. For me, the kitchen is all of this but it’s also been the constant in a messy and meandering hair journey. It’s the place where a smaller version of me would sit while my mum would attempt to smooth down my roots with a metal hot comb heated up on the sweltering flame of the gas stove. It’s the place where I would sit and wait for my hair to be chemically straightened with the creamy crack of an at-home relaxer kit. It’s where a month ago, I had all of my relaxed hair cut off. It’s also the place where all 26 inches of my belly button–grazing wig are currently drying, draped over a clothes dryer with a towel underneath to catch the slow drips of water as she waits to be styled. I’ve been wearing wigs for around four years now and I must say, we’re still going strong. The honeymoon phase, in which I revelled in wide-eyed wonderment over the fact that wigs could actually look not only natural but downright fierce, may have passed. But we’re now into the comfortable days of our relationship where I get annoyed and nag when my wig starts to shed. For the most part, however, we’re happy. I even look for ways to spice our relationship up, which is usually experimenting with new techniques to make the hairline of the wig look like it's actually sprouting from my own scalp. But the main reasons why I started wearing a wig remain. It’s low-maintenance, and I can style it both on and off my head. Let’s face it—drying hair overnight in the kitchen and not having damp pillowcases is the very definition of luxury. Before I started wearing wigs, it definitely felt like light-years away from a weave, until I fell down the YouTube tutorial rabbit hole and watched women making their own half wigs. Armed with a kit of £500 worth of human hair, wig caps, a wig stand and a needle and thread, I got to work on making my own. It was a wig-weave hybrid that I clipped in and it saved me having to visit my hairdresser every six weeks to change my sew-in weave. A few months later, I realised that I was ready to step up from my homemade version and had my usual virgin hair supplier Hair From Him make a full wig with wig maker Wigs by Dee Dee, and, well, that was all it took for me to be initiated into the wig-wearing cult. Social media is the way to go for all wig matters. It’s been an invaluable source for finding wig makers and suppliers as you can see their work in all its glory. Believe me, wigs are not made equal, and I didn’t want plastic-looking strands or having my wig blow off by a gust of wind through the tube platform. So it’s vital to get that 3D action of a video to see the hair in motion and also to get a close-up on the lace-frontal. It’s the most important component of a wig, and the reason I felt it was safe enough to get one. The lace frontal or closure is used to create an undetectable hairline and the fake roots are usually bleached to mimic natural hair. It’s also really beneficial to see customers, and not only models, wearing the wigs too. 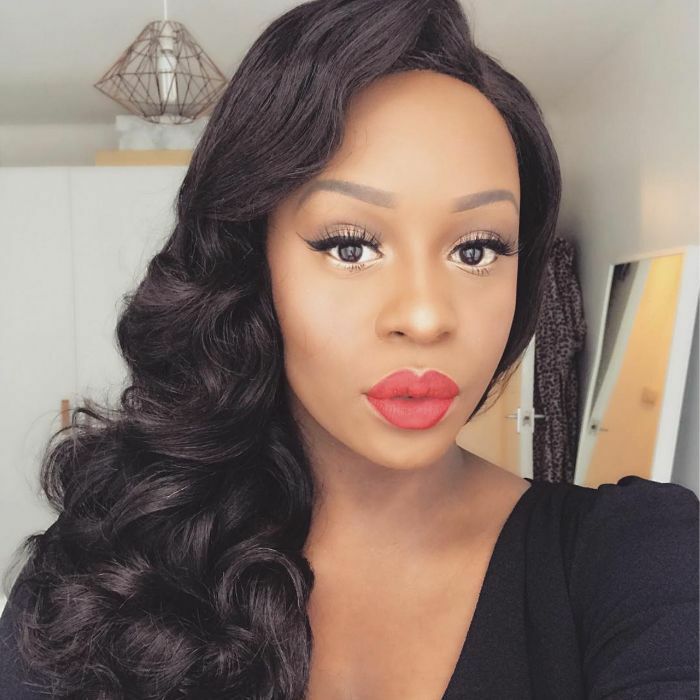 There are many places to buy high-quality wigs that are ready to wear and can usually be customised or fitted to your needs, such as Chrissy Bales, Wig by Yomi, and always look out on Instagram, especially @hairfromhim, @wigsbydeedee, @melissajade23 and @hausofshee, who also offer their services there. I always wear the same style of wig, but textures vary, and you can get a wig that resembles your natural hair. Plus with virgin hair, you can dye, cut and transform it as often as you choose. If that’s what you’re looking for, it’s a great way to shift styles or just have a wardrobe of options to pick from depending on your mood. It might sound counterintuitive, but my obsession with wigs actually comes from the fact that its given me a deeper connection to my own hair. A wig gives me more access to reach, treat and protect my afro hair. It’s no longer embedded within sew-in weaves or extension glue meshed to my roots. Wigs also prompted me to re-start the process of getting to know and love my natural hair again. This time without the pressure of having socially acceptable picture-perfect curls. My hair is healing after years of manipulation and not really knowing what to do with it. It’s tucked away under a wig cap to just do its own thing, and that’s my own way of embracing my natural hair. For the last six years, I’ve been keeping a little eye on the natural hair movement. I stalked forums for hair tips and routines, but I wasn’t ready to take the plunge into growing out my relaxer. I’m not going to lie, I was hesitant, and, as we’re being honest here, that little eye I kept on it was more of a full-grown side eye. I felt that the movement came with a large helping of judgement and shade to black women who still had relaxed hair or weaves. I felt pressured to join because I didn't want my blackness and authenticity questioned. I started to wonder if I was a fraud for covering my natural hair and not publicly embracing the kinkiness of my coils in a really big way, and quite frankly, I didn’t like it. This one-size-fits-all approach didn’t work for me. I’m proud to be a black woman, and in the same way that blackberry-hued lipstick and Bambi-length false lashes are accessories I use in my identity formation, so is how I wear my hair. That’s all it is—an accessory. Whether it’s a wig, weave, afro, braids or a relaxer, it doesn’t matter if it’s your choice and you’re looking after your hair. There’s not a spectrum of blackness when it comes to hair, one style doesn’t make you more or less black than another, as women we’re multi-layered and naturally our relationships with our hair are also. Luckily, the conversations in the natural hair movement have evolved and aren’t so polarised, and I got out of my own way and found a space for myself within it. I also stopped caring about if I was going to wear my natural hair in public or not and started paying more attention to my hair health. My shoulder-length relaxed hair was braided away under my wig and full of dead ends; it was weak and broken. The chemicals of the relaxer provided a false illusion of health as my hair was long, but really it was crying out for a rescue. With any major life decisions, I research it like it’s a PhD project (I’m a Sagittarius through and through), so I spent hours watching videos and reading natural hair blogs on how to start. In the past I tried to just extend the time between relaxers, and battling with two hair textures that are going at it like they’re in a boxing ring is no joke. I would be close to tears in the shower trying to detangle through natural roots and long and confused relaxed strands. So I decided to start again and went for the big chop—which basically involves cutting all the relaxer off and leaving the natural roots, so you have a teeny baby afro. Once my hair was buzzed off, it was like stepping off a cramped plane and walking onto the tarmac of a balmy Mediterranean runway. The sigh of relief was palpable, and for the past month I’ve finally nailed my hair routine, and my hair is thriving. It’s been a process of reimagining who I am. It wasn’t until I had that physical sensation of being able to run my fingers through the natural, un-manipulated textured hair that grows from my scalp just as it’s supposed to that I really got it. That feeling doesn’t change when I place my wig on top of my hair either. I feel connected to the ever-changing nature of my hair and relish in seeing it grow and change, noticing how different products feel in it. I don’t know if I’ll still be wearing wigs this time next year or if I’ll be wearing my natural hair, and that’s kind of the beauty of it. From the early days sat in the kitchen wishing for uncomplicated hair to where I am now, I’ve slowly started to unpack many of the complexities that are tangled up within my own hair. We so often see hair as a political issue, an identity marker, a topic to be analysed; it’s also a cultural connector that speaks to who we are and where we’re from. This doesn’t make it concrete though—it’s far from that—hair embodies fluidity, the roots of it might help to shape us but the ways we can alter and decorate the strands are open to all kinds of possibilities, and isn’t that the whole point?